The present report has been prepared as a part of a scoping study for CCS in India carried out by The Energy and Resources Institute (TERI), with support from the Global CCS Institute. The study was conducted to identify the potential role for CCS in India’s GHG mitigation strategies through an examination of issues, opportunities and barriers to the deployment of CCS. The conclusions of the report should help in drawing a roadmap for CCS implementation in India. The Delhi Declaration on Clean Coal is a joint statement developed by the Energy and Resources Institute (TERI), European Centre for Energy and Resource Security (EUCERS), Atlantic Council, and the Global CCS Institute. 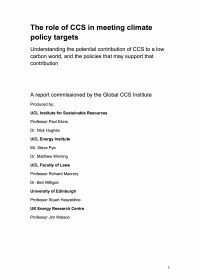 The statement provides recognition of CCS as an important aspect of clean coal technology, and appeals to governments around the world to dedicate effort to building a framework and political climate in which CCS projects can progress rapidly. The statement was a key outcome of the International Workshop on India’s Clean Coal Future, which focused on India’s growing use of coal in the energy sector and experience with clean coal technologies.